Thank you for your interest in becoming a vendor with Helena’s Farmers; Market—a Saturday morning tradition for 45 years. Helena’s Farmers; market is proud to serve as a small business incubator for the many local farms, bakeries, specialty food producers, and artisan crafters around Montana. We have a commitment to creating a diverse marketplace with the highest quality, locally produced products available. The Saturday market on Fuller Avenue opens for business at 9:00 a.m. and closes at 1:00 p.m. Set up time is 6:30 a.m. to 8:45 a.m. 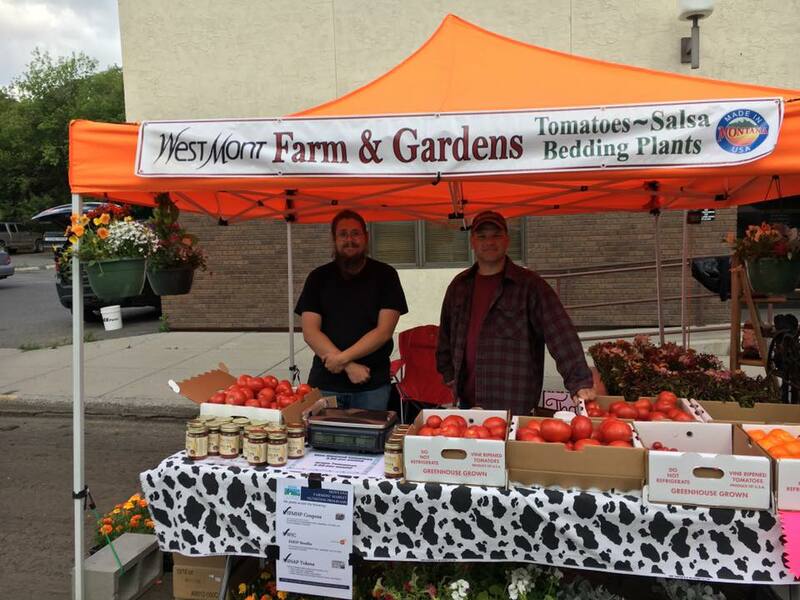 The Tuesday market opens for business at 4:00 p.m. and closes at 7:00 p.m. Set up time is between 3:00 and 4:00 p.m. There is no market fee for the Tuesday markets, but you should already be a vendor at the Saturday markets. Reserved vendors must prepay a non-refundable fee prior to June 1st which guarantees them a seasonal, reserved space each market day. The reserved vendor will retain the same location throughout the season. Currently, the fees for reserved spaces are: $250 for 10 feet; $450 for 20 feet; $625 for 30 feet, $800 for 40 feet, and $975 for 50 feet. If a new vendor decides to reserve a space for the season after June 1st, the request must be made in writing to the Board of Directors before the next scheduled Board Meeting. For details on time and location of the next Board Meeting and to find out how to give written notice, contact the Market Manager. Non-reserved vendors must check in with the market manager prior to entering the market and/or setting up their space. Vendors selling perishable products have priority for space. Fees for reserved spaces are: $250 for 10 feet; $450 for 20 feet; $625 for 30 feet, $800 for 40 feet, and $975 for 50 feet. Non-reserved vendors must pay $20.00 per 10 feet of space which will be collected by the Market Master. Please read our 2018 Vendor Handbook for complete information about the requirements and expectations of participating in one of our markets. Can anyone sell their wares at the Farmers' Market? The market is restricted to vendors who are residents of Montana and who sell items grown or manufactured in Montana, or items that are value added in Montana. Do I need to complete an application prior to coming to the market? No pre-application is required. Come Saturday morning between 6:30 - 8:00 am and find the Market Manager. The Manager will assign you a space. The manager's cell phone number is 437-1855. A copy of the rules is given to you when you arrive; you must complete a short form acknowledging that you received a copy of the market rules. Can I sell food and/or drinks at the market? In order to sell baked goods, jellies and jams at the market, you have to have a certificate from the County Health Department. The application form for this certificate is located on the home page of the web site. Other food/drink vendors must contact the County Health Department and obtain all the necessary licenses and/or permits. Is there a discount to be a vendor if I pay for a space early? Yes, you may permanently reserve a 10' X 10' space for the season (27 Markets) for a fee of $250.00. This space will not be filled by any other vendor unless you decide not to attend a particular week(s). You may also reserve multiple spaces. For 2 spaces, the fee is $425.00. 3 spaces is $600.00, 4 spaces is $775.00, and 5 spaces is $950.00. If I want to be a vendor, may I just set up anywhere? No, if you wish to be a vendor and do not have a reserved spot, you must check in with the Market Master who will assign a spot to you for the day. The Market Master will be wearing a red short or long sleeved t-shirt with the Farmers' Market logo on it. Do I need to contact the Manager if I have a reserved space, but will not be coming to the market? Yes. If you have a reserved space and you are not coming to the market on Saturday, you need to inform the Manager. If you have a reserved space and are running late, you must call the manager prior to 8:00 am. After 8:00 am the unfilled reserved spaces will be given away for that day to a different vendor. How do I get involved with the governmental food subsidy programs like WIC, EBT/SNAP, and Senior Coupons? What does the market cost? The Market is free to the public to attend and shop. To be a vendor at the Market, the cost is $20.00 per 10' X 10' space. Is there space for new vendors? Yes, but space fills fast on a first come first served basis.